Una suite per il video editing leggero professionale non lineare. 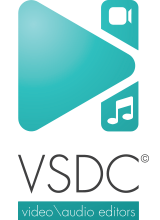 VSDC Pro Video Editor 5.5.0 era disponibile come app gratuita il 20 ottobre 2016! Una suite leggere professionale per il video editing non lineare per creare un film di qualsiasi complessità - da un saluto per la famiglia, un drone oppure un videoclip d'azione in qualità UHD per una presentazione di lavoro con un'ampia gamma di tabelle e diagrammi. Toolset essenziale per video editing professionale: modalità di combinazione, tool Masschera, Chroma Key multicolore avanzato. oops, I'm sorry I did not see the reference link to the key to activate. No problems with getting serial key. No problems with installation and activation. No problems with software remaining as FREE (that other forum commenters face). It changed to Pro immediately after serial key is input to activate. The software is slightly complicated to use because it is powerful. It has many built in effects for video and audio. Once you get used to it, should be fine. Can handle simple cut and join, split or combine if you don't need the powerful features. It does not accept your video straight away. You have to cretae a "New project" and click + drag your video into the panel. No problems with getting serial key. No problems with installation and activation. No problems with software remaining as FREE (that other forum commenters face). It changed to Pro immediately after serial key is input to activate. But please note that during installation, this installs a version of Visual C++ Microsoft Visual C++ 2013 Redistributable (x86) Version 12.0.30501.0 (17.19 MB ) The software is slightly complicated to use because it is powerful. It has many built in effects for video and audio. Once you get used to it, should be fine. Can handle simple cut and join, split or combine if you don't need the powerful features. Can rotate the video. (not many video editors have this important feature) It does not accept your video straight away. You have to cretae a "New project" and click + drag your video into the panel. Been using the free version for a number of years and it is excellent, a really powerful video editor. It'll be interesting to see what the pro version can do. Been using the free version for a number of years and it is excellent, a really powerful video editor. It'll be interesting to see what the pro version can do. Download, installation, and activation all went flawlessly. I received the key in less than a minute. I confirmed that I am indeed running the Pro version, licensed to "Special Edition GiveawayoftheDay." "Pro solution. You can purchase an annual subscription..."
QUESTION: Does this mean I just got a one-year trial? That's certainly what that text suggests. If so, this whole thing is a sham. Download, installation, and activation all went flawlessly. I received the key in less than a minute. I confirmed that I am indeed running the Pro version, licensed to "Special Edition GiveawayoftheDay." BUT NOTE THIS: On the "thank-you" webpage which pops up after installation, is this quote promoting their product: "Pro solution. You can purchase an annual subscription..." QUESTION: Does this mean I just got a one-year trial? That's certainly what that text suggests. If so, this whole thing is a sham. As it happens I downloaded the free version of this yesterday when Movie Maker didn't do what I needed done, in a hurry. This offering didn't disappoint and in the very short time I had (This was 11pm) I was able to modify a video as I required in no time. Only this I couldn't find was 'Fade in/ Fade out' on the music but I would be surprised if it isn't there - somewhere. If I get time I will comment later but I shall be keeping my copy - Esp now I have the full version.